Shoden Eigen-in is a Zen temple. It is also a sub-temple of Kennin-ji, which is the head temple in the Rinzai Kenninji Sect of Buddhism. A sub-temple was usually a temple built after the death of the founder of a sect, or a high priest of a major or famous temple. It would have been built by disciples within the precincts of the temple to hold the grave and eternalize the virtues of the deceased. Shoden Eigen-in was formed upon the merger of multiple temples that were patronized by military leaders in Japan. At the time of foundation, Shoden Eigen-in was two separate main temples, named Shoden-in and Eigen-an. 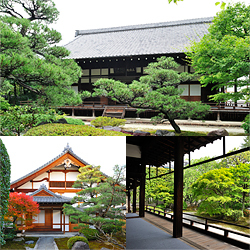 Shoden-in Temple was established in 1264 by the Zen priest, Gio Shonin. At the time it was located in Kyoto’s Gion district. The temple fell into ruin after the Onin War in the 15th century. 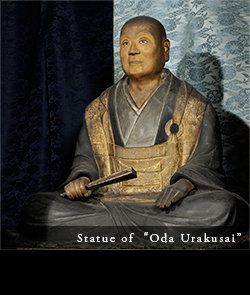 However, it was restored in 1618 by Oda Urakusai, a younger brother of Oda Nobunaga and a student of the Tea Master, Sen-no-Rikyu. 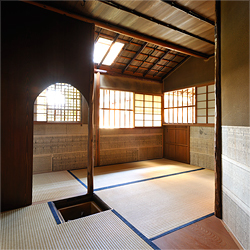 Oda Urakusai practiced tea ceremony at the temple and for that purpose built a detached teahouse named Jo-an. Shoden-in then prospered for many years along with numerous sub-temples built within its precincts. Eigen-an Temple was established in 1346 by the Zen priest, Mugai Ninko. This temple also was patronized by Japan’s military leaders. During the “Northern and Southern Courts” period, Eigen-an became the family temple of Hosokawa Yoriari, a military commander of the time. In the Warring States period, the military leader Fukushima Masanori used the temple as a temporary residence. Eigen-an was to be abolished in the Meiji era (from the late 1800s). However, Shoden-in was relocated here and the two temples were subsequently merged into one by the statesman Hosokawa Moritatsu, a descendant of Hosokawa Yoriari. The temple formed from the merger was named Shoden Eigen-in. Shoden Eigen-in is thus the result of merger of multiple temples and sub-temples. There are many blank periods in the history of Shoden Eigen-in, and investigation into the past continues even now. Shoden Eigen-in is famous for the artistry of the temple’s partition paintings, for the teahouse named Jo-an, and for its beautiful garden. Shoden Eigen-in is renowned also for the artistry of the temple’s partition paintings. One of Japan’s best-known painting arts, partition paintings are painted on the sliding doors found in typical Japanese houses. Famous partition paintings in Shoden Eigen-in include paintings by Kano Sanraku, a renowned artist of the Edo period, and by Hosokawa Morihiro, a Japanese artist of the present day. Kano Sanraku is considered a legendary painter of the Edo period. His work Renro-zu, held in Shoden Eigen-in, expresses the transience of human life and is a beautiful and deeply spiritual work. 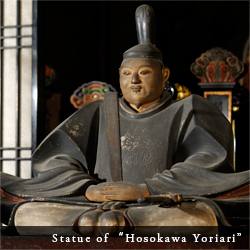 Hosokawa Morihiro is an outstanding Japanese artist, and a descendant of Hosokawa Yoriari. He is also renowned as a former Prime Minister of Japan. Shusei, one of his works held by Shoden Eigen-in, expresses hints of autumn in distant mountains. It is a magnificent, illusory and beautiful work. The teahouse Jo-an is a National Treasure of Japan. It was built as a structure for Japanese-style tea ceremony, in which the Tea Master prepares tea and offers the associated traditional hospitality to invited guests. Oda Urakusai built the teahouse early in the 17th century when restoring Shoden-in Temple. He became a Christian (a Japanese Christian priest) and according to one theory, the name was derived from his baptismal name, The teahouse Jo-an in Shoden Eigen-in today is a replica. The original was sold to the Mitsui conglomerate in 1901 and moved to Tokyo. In 1947, the original was moved to Inuyama City in Aichi Prefecture, where it still stands. The teahouse in Shoden Eigen-in today was newly built in 1996 as a replica of the original teahouse before it was sold. Copyright © shouden-eigen-in All rights reserved.